Seray and Lukas in Lucideon’s Information Centre. 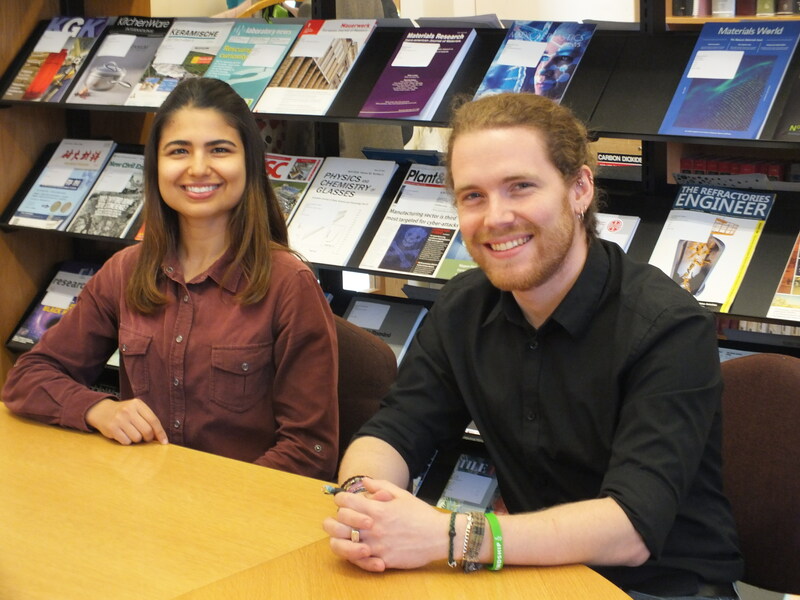 The first successful outcomes of Lukas Gritsch, ESR3 project “Biodegradable and Bioresorbable Polyesters”, and Seray Kaya, ESR7 project “Antibacterial mesoporous bioactive glass (MBG)”, were recently published with open access in renowned international journals. The first article, entitled “Fabrication and characterization of copper(II)-chitosan complexes as antibiotic-free antibacterial biomaterial” is one of many successful achievements of the collaboration between the Institute of Biomaterials at the University of Erlangen Nuremberg and Lucideon. It was published in September 2017 by Elsevier’s journal Carbohydrate Polymers and it is available for download here: http://www.sciencedirect.com/science/article/pii/S0144861717311372 . In the paper the use of chitosan as a natural carrier for the therapeutic delivery of copper is reported. Chitosan was selected because of its known ability to chelate heavy metal ions. Moreover, chitosan has several beneficial properties such as high biocompatibility and regulation of blood coagulation. The role of copper in angiogenesis and bacterial inhibition, if appropriately engineered, can be used to deliver ad hoc therapies to promote wound healing (e.g. in diabetes foot ulcer) as well as in scenarios where an antimicrobial effect is needed to address the issue of drug-resistant bacteria. The research group is now focusing on an extensive investigation of the combination of polyesters with antimicrobial chitosan and its fabrication using several techniques (e.g. electrospinning and additive manufacturing). The dissemination of the outcomes of these studies is planned to happen in the second half of 2018. You can download the review paper through the link: https://doi.org/10.1016/j.msec.2017.11.003.